Networked Service Society | ERCIS Competence Center "Service Science"
The primary objective of our multi-national project is to strengthen the long-term research structures of the ERCIS with our partner institutions in the Asian-Pacific region. For this purpose, research visits, workshops, and seminars are being conducted cooperatively. We cooperate in three in decisive areas. In Joint Research, we perform high quality research and publish our results in leading peer-reviewed journals and present them on international conferences. In Joint Industry Projects, we perform research that ‘matters’, in close cooperate with industry partners and the public sector. Our objective is to establish long-term cooperation initiatives funded by these stakeholders. In Joint Education, we develop and implement joint education programs for increasing the mobility of our students and PhD students. 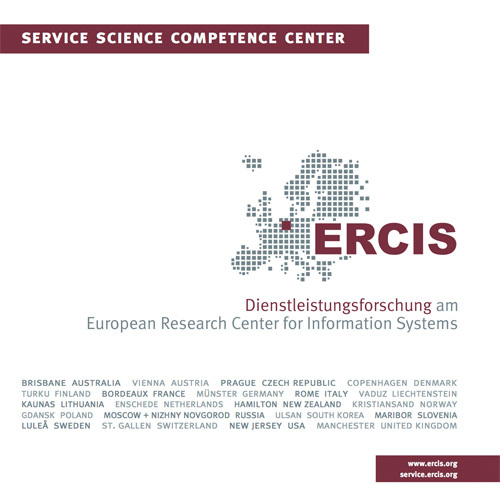 We establish a Service Science Competence Center at the ERCIS – a network of researchers in information systems development and organizational design. In the first funding period, we strengthened our cooperation and established new ties with partners in Korea. In the second funding period, these structures will be institutionalized further. Our long-term goal is to align our initiatives with other activities the ERCIS performs in cooperation with the BRICS (Brazil, Russia, India, China, South Africa) countries. The NSS project is kindly supported by the International Office of the German Ministry of Education and Research (promotion sign: 01DR12003). More information is available at: http://www.networkedservicesociety.net/.